A paper manufacturer was having issues with their measuring equipment (reference photo above). They were producing 6” (152mm) wide crepe paper which is very thin and dusty. As it would pass through the machine, a real-time measurement of basis weight and moisture content was being performed. The basis weight of the sheet was around 14g/m2 which is like facial tissue. The machine was giving false errors in the basis weight measurement. As they opened the device, they noticed dust particles on the optical lens. Because the basis weight was so small, any dust would cause a false reading. They contacted EXAIR to see if we could help with their problem. 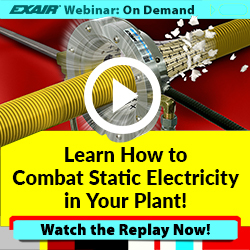 With a dry fibrous material like crepe paper, static can be a big issue. Static has a strong force that can cause small fragments to “stick” to surfaces. As you can see in the photo, the paper material is sticking to the sides and lens of the measuring device. For this application, I recommended two pieces of the model 112206 Gen4 Super Ion Air Knife Kits. The Gen4 Super Ion Air Knife is uniquely designed to have two functions; remove static and blow off dust. The Gen4 Ionizing Bar creates both positive and negative ions to remove any type of static charge. The Super Air Knife creates a laminar air stream to carry the ions and also generate an even blowing force to remove the dust particles from the surface. 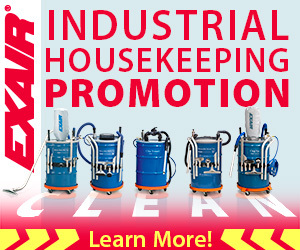 With this combination, it becomes a very effective non-contact way to remove the contamination. This was an important requirement as the crepe paper is very thin and could break very easily. They were able to mount one Super Ion Air Knife above and below the paper in order to blow the dust particles in a counter-flow direction. This would keep the particles from entering the measurement device. The Super Ion Air Knife Kit includes the Super Air Knife with a Gen4 Ionizing Bar attached. The kit also includes a power supply, filter, regulator, and a shim set. The power supply is specifically designed for the Gen4 Static Eliminators. The Gen4 Super Ion Air Knives use the high voltage from the power supply to generate enough ions to remove static from the paper at a running speed of 49.5 ft/sec (15m/sec). The filter will remove any contamination and liquid water from the compressed air system before it enters the Super Ion Air Knife. This is important to keep the product clean. The shim set is a set of three different shims with a thickness of 0.001” (0.025mm), 0.003” (0.076mm), and 0.004” (0.1mm). They are used to dramatically change the blowing force from the stock shim at 0.002” (0.05mm) thick. Being that the paper was extremely thin, they opted to put the 0.001 (0.025m) thick shim inside the Super Ion Air Knife. With the regulator in the kit, the customer could “dial” in the correct amount of force to keep the machine running optimally without breaking the delicate paper. When the customer installed the Gen4 Super Ion Air Knives just before the entrance into the measuring device, the air stream was able to carry the ions to neutralize the static and to remove the dust from the paper surface. The system was now able to make accurate measurements without disruptions. For this customer above, the Gen4 Super Ion Air Knives made their system run accurately and consistently by removing any pesky dust particles. If you have an optical device that needs to stay clean, you can contact an Application Engineer to review your application. An EXAIR Vortex Tube supplying cold air into a camera lens housing. An application we see from time to time involves the cooling of camera lenses as they “watch” for various materials in automated processes. The process usually involves some sort of part detection, checking object specifics for adherence to quality standards, or searching for items in need of rejection. These process are often fully automated, requiring the camera to process a continuous stream of information and to be housed in the same environment as the materials being monitored. At a waste sorting facility in France, an end user was experiencing an overheating of their camera. The result of the overheating condition was unwanted downtime while the internal camera electronics cooled and could not be used. This meant that an expensive, complex, and efficient piece of equipment was out of service, creating a bottleneck in the waste sorting process. 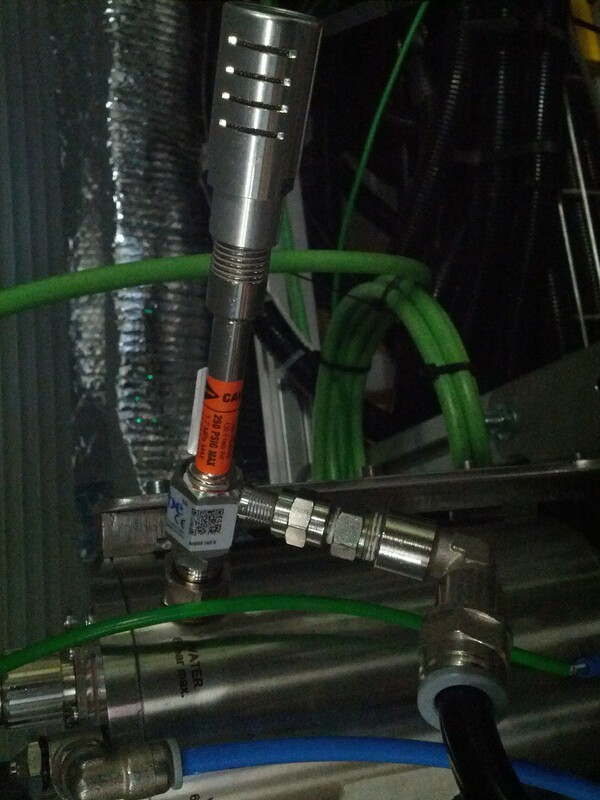 To solve this overheating condition, the end user worked through the EXAIR distributor in France, Kermaz Pneumatic, to find a solution with an EXAIR Vortex Tube. 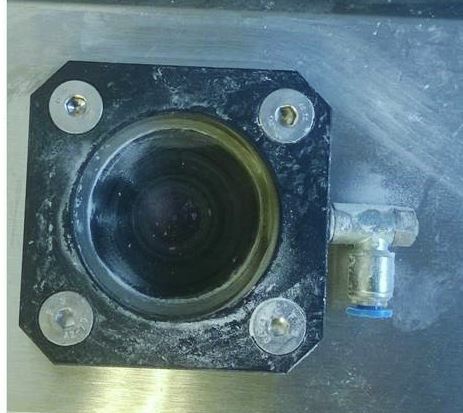 The Vortex Tube was installed so that cold air was created and supplied directly into the camera lens housing. The end result was a reduction in heat at the camera lens, allowing the machine to function at full capacity without stoppage, effectively removing the process bottleneck. If you have a similar application and think EXAIR may be able to help, contact an EXAIR Application Engineer. Many times we will be contacted by clients who provide vision inspection systems for a variety of industries. These companies are involved in applications to inspect everything from part conformance to product counting to processes to filling applications. 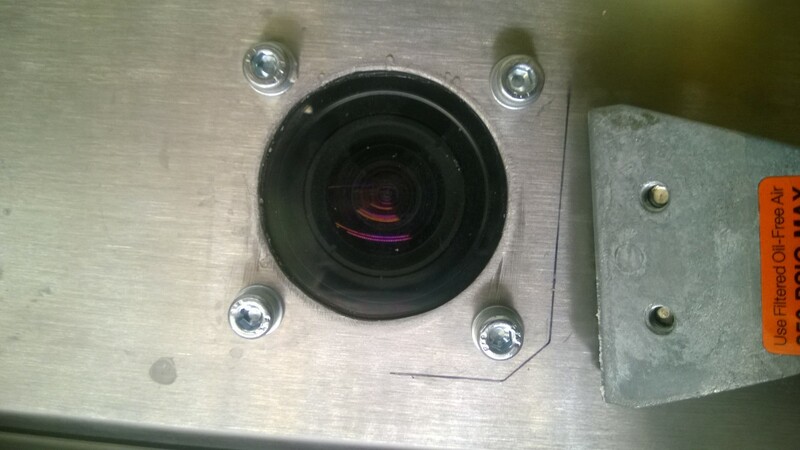 In the first photo above a customer had their vision inspection system set to inspect the filling of a powder material into its container. The problem is that the fine, dusty nature of the product would cause a small cloud to form near the filling point which would end up settling onto the lens area. Over time, so much build up would occur that the vision inspection system was rendered useless. The customer had a small air jet set up as shown in the photo on the left, above. The problem with their air jet was that it did not provide full coverage across the width of the lens and allowed dust to still settle there. You can see it in the photo. After the customer contacted us and described the situation and the size of their lens, we recommended model 1122 2” Flat Super Air Nozzle with the thinnest shim available which is .005” thick. The 2″ Flat Super Air Nozzle was able to provide an airflow that covered the full diameter of the lens and blast any debris away. In the end, they removed the homemade small air jet assembly and simply blew air across the lens with EXAIR’s nozzle. See photo on the right above. Vision inspection cameras, lasers, and sensors are found in a variety of dusty and messy environments. Inspection systems on filling lines, sawing applications, weighing machines and grinding applications are just some of the notoriously problematic processes. If you are involved in a process that has trouble keeping the vision inspection lenses clean, the 2” Flat Super Air Nozzle is a great way to mount an engineered solution that won’t run you out of house and home on your compressed air usage. And best of all, it actually does a good job. If your application is slightly bigger, smaller, dirtier etc., EXAIR’s unmatched selection of nozzle and blowoff products can likely provide a solution. Over the year that I have worked at EXAIR so far I have had a fair share of calls come in from movie production / filming crews that are looking for ways to keep the camera lenses clean and clear of water during the wet shoots they are doing. Several film houses and production crews have had exceptional results using our Air Knives. What the crews will do is mount our Air Knife across the top of the camera lens blowing downward to create a barrier of air for the lens. This won’t disturb the shot or the focus like a protective sheet of Lexan or glass could. What the air stream will do is help keep all the droplets off the lens and blow the water away from it. A Super Air Knife or Full Flow Air Knife typically works just fine and doesn’t consume a lot of compressed air or nitrogen. Which is generally present on most shots or you can get it very easily from a rented compressor. If the video above would have been a filmed shot from a stationary point the film would have been nice and clear if an EXAIR Air Knife would have been present to blow off the rain. It could have even turned out something like this. So if you are filming a movie and debris or water on the lens is a problem just give us a call. We’ll help you size the appropriate Air Knife for the lens you are using. Oh yeah. That second video is me.